Due to rather inclement weather conditions across Malta at the beginning of February, two matches scheduled to take place in the Maltese BOV Premier League on 1/2/14 - Sliema Wanderers against Floriana, and Hibernians versus Qormi. The games were played on 3/2/14 at the Hibernians Ground in Coradino, and Old Firm clash between Sliema Wanderers and Floriana was the second fixture in the double-header. There was a time when a match between Sliema Wanderers and Floriana would attract an attendance of several thousand football followers from across the Maltese islands; however, the "Old Firm," as both clubs are (still) collectively known, have had to play second fiddle in recent years to Valletta and Birkirkara. Attendances have dipped, and a crowd of some 200-300 supporters turned up to watch this particular edition of one of the most celebrated fixtures in Maltese football. Sliema were forced to make a late change to their starting line-up when Paltemio Barbetti, originally listed as a substitute, took the place of Abubaker Bello-Osagie in midfield. 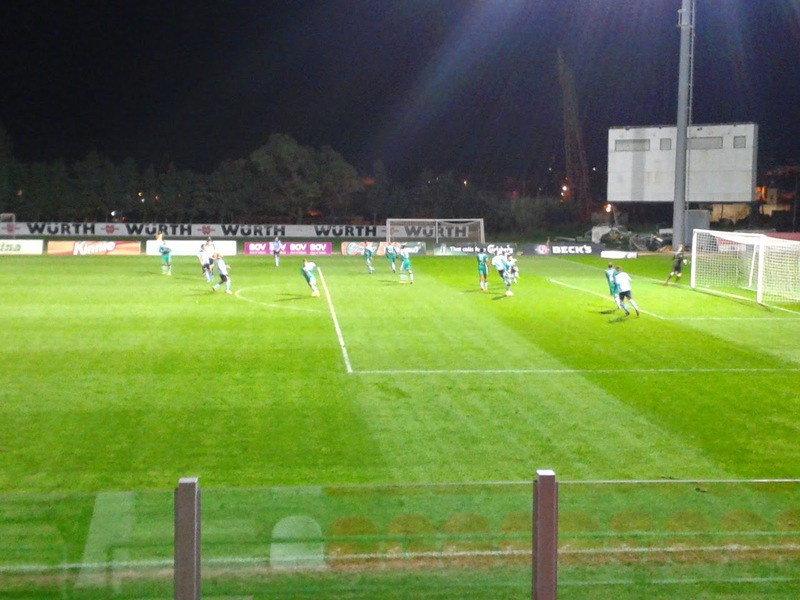 Regardless of any inconvenience which might have been caused by this enforced change, Sliema began brightly in what was a fairly quiet first 15 minutes or so; captain Alex Muscat had a half-chance from a second-minute corner but shot wide, whilst, four minutes later, Marc Scierri's shot went over the Floriana bar, but 'keeper Daniel Hanford was untroubled. The game only really sprang to life after a quarter of an hour when a verbal bust-up ensured between Scerri and Gary Muir from Tal-Irish, which was ended after referee Glen Tonna's intervention. Brooke Farrugia had Floriana's first shot in anger in the 18th minute from more than 20 yards out, and it caused Wanderers' goalkeeper Henry Bonello to scurry across goal, but the shot flashed the wrong side of the post. Stanley Owahuchi put Admir Vladavic through for Sliema more or less from the resulting goal-kick, but Vladavic's weak shot was easily saved by Hanford. A Miur free-kick in the 20th minute, taken from the right-hand angle of the penalty-area, seemed to completely bamboozle both the Sliema defensive wall and Bonello in goal, who could only help the ball into the right-hand corner of the net, and Floriana were in front. Wanderers slowly clawed their way back into contention, and Matias Muchardi forced Hanford into a good save with a header from 10 yards out which came after a cross from the right. Two efforts from Floriana followed in the 27th minute, Luca Casha shooting tamely after working hard to get himself into a good position, and Igor Coronado shooting low - but just wide - from the edge of the box after the Blues lost possession from the goal-kick following Casha's effort. Sliema took advantage of the reprieve; within three minutes, they were level, courtesy of a bullet header from Stefano Bianciardi, who met, and dispatched, Vladavic's corner-kick from the right-hand side with some authority. Another quiet period followed, puncuated only by shots from Floriana pair Diogo Pinheira De Sousa and Farrugia; Pinheira De Sousa fired just over after Sliema lost possession and he received the ball from a team-mate, whilst Farrugia's shot shortly afterwards from more than 20 yards out was easily saved by Bonello. The 43rd minute almost saw Sliema go in front: a cross from the right hand-side of the Greens' penalty area was picked up by Ohawuchi, who passed to Muscat, but the Wanderers' captain's turn and shot from close range was well dealt with by Hanford. The second half was two minutes old when Vladavic's long ball reached Ohawuchi, who slid the ball to Trevor Cilia some 20 yards from goal, but his effort from the left-hand side went over the angle of Hanford's goal. 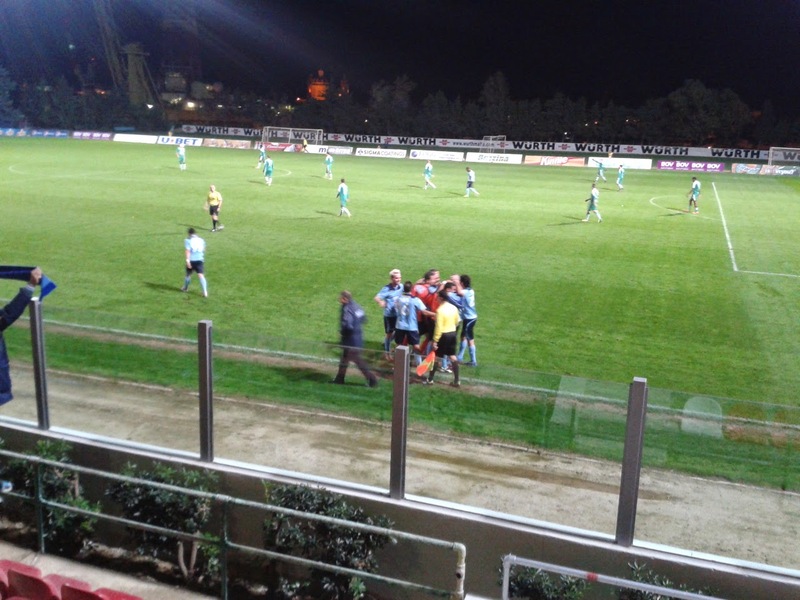 Pinheiro De Sousa went down in the Sliema penalty-area, but his team-mates' appeals for a penalty were ignored by the referee, but this was a rare Floriana foray into Sliema territory in the first ten minutes or so of the second half, though Pinheiro De Sousa and, particularly, Sacha Borg did have shots on goal before the hour mark, Borg coming close with a curling shot from the left which went just a yard wide of Bonetti's left-hand post. Both efforts sandwiched a Bianciardi header from a John Mintoff free-kick, but Halford foiled the Blues again. Things changed suddenly after Borg's shot, which seemed to awaken a sense of urgency in the Sliema collective, and they immediately began to play with much more drive and purpose. A flurry of shots rained on Halford's goal during the next six or seven minutes, and Ohawuchi's shot in the 61st minute was just the start. Barbetti won the ball in midfield, brought it forward and passed to Ohawuchi, who shot straight at Hanford. Another effort from Ohawuchi, one from Scerri and two from substitute Ivan Woods followed. Woods came closest with his swivel and shot on 66 minutes; this followed some good play and an inviting cross from Matias Muchardi, but he shot just wide. Persistence always pays off, or so it is said, and Sliema finally got their noses in front on 68 minutes. Owahuchi bulldozed his way into the Floriana box and passed to Woods, who turned and crossed and saw Trevor Cilia arriving to knock the ball past a flailing Hanford and the last defender from close in. Five minutes later, it was 3:1 to Wanderers, when Baretti took the ball from his own half and passed to Mintoff on the wing; Mintoff beat two defenders before sending Hanford the wrong way at the near post from 8 yards out. The goal seemed to deflate the Floriana team completely, and Sliema pretty much coasted home for the last 15 minutes or so, with both teams creating little of note, though Ohawuchi was fouled by Muir just inside the Greens' penalty area with ten minutes left on the clock. Ivan Woods stepped up to put the penalty past Hanford, low into the right-hand corner of the keeper's net. And, apart from a Vladavic free-kick which sailed over Hanford's bar in the 88th minute, that was pretty much that. Woods' introduction was a pivotal moment in the game, though Ohawuchi looked threatening throughout most of the 90-plus minutes, and the Sliema defence, well-marshalled by Muscat, looked fairly secure. John Mintoff also had a good game, as did Muir for the losing side, though Hanford could legitimately claim to be his side's man of the match. THEN AND NOW: Floriana ended the 2013-14 regular season in eighth place, which meant that they were forced to take part in the series of matches in the relegation pool. However, they were never really in danger of being relegated, and six wins out of ten matches saw them rise to the top of the pool and out of harm's way. The Greens have already beaten Sliema twice this season, once in the league, and also on penalties in the third round of this season's FA Trophy. They were drawn to face Qormi in the next round, and the game is scheduled to take place on 21/1/14. Floriana currently sit in fifth place in league competition, whilst Sliema Wanderers are in seventh. AUTHOR'S NOTE: Thanks, as ever, go to the MFA matchday staff. The Times of Malta was a useful cross-referencing tool.